Both of my girls love to play restaurant, which usually involves creating some sort of menu. Sometimes we draw menus, sometimes we cut and paste pictures from grocery ads and magazines. We also have a collection of kids’ menus from restaurants we’ve been to. I decided to give them another option for menu creating by printing out different food items on printable magnet sheets. 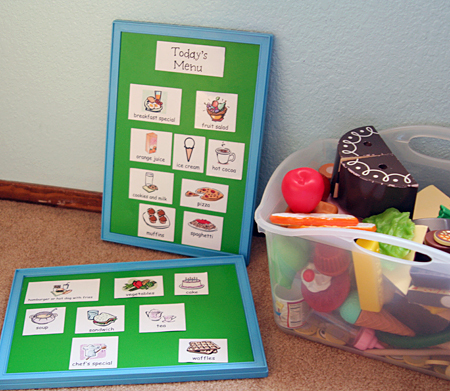 We have two small magnet boards to use, but you could just as easily use a small cookie sheet or even the fridge. 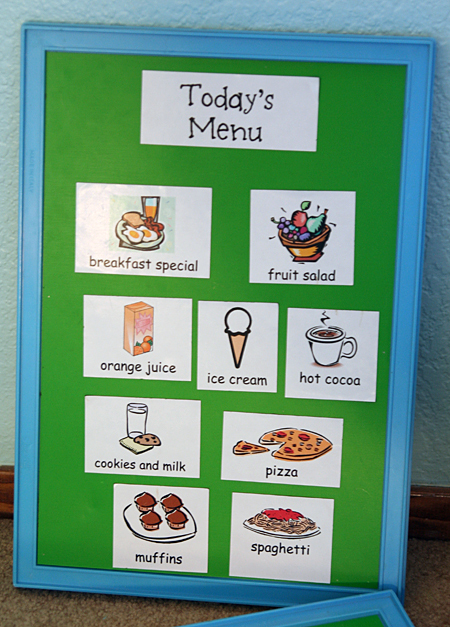 For the menu items I used clip art from Microsoft Word and tried to choose foods that matched our play food collection. The magnets are thin, but they seem to be holding up well. Fun and easy — and it gets used all the time. Off to play with my chefs and servers! Your blog truly is wonderful in reminding me how to play with my own child. While I have an only child and work from home, I find it especially difficult to keep my 3 year old busy. I’m all about “free play” and don’t feel the need to schedule every spare second of my son’s time but he does love to be involved and explore A LOT! I’m currently wanting to start a Mom Blog for other mother’s in my area so that we can showcase our city and the wonderful things that are available to us as parents and families in our “own backyard”, literally or metaphorically. This blog gave me so much encouragement and I thank you for that! Wow! I love this, what fun. I would like to know where you got your magnet boards? I’ve been looking for some like that. My kids will love this idea, thanks for sharing! I love this – awesome, my kiddos love to play “kitchen” as they call it and would think this was just the coolest thing ever. Thanks for always sharing such awesome ideas! Great idea! I think my two little ones would enjoy this idea.